Over the past couple of weeks I’ve had the pleasure of running into some of the very wonderful Jamie Oliver crew. 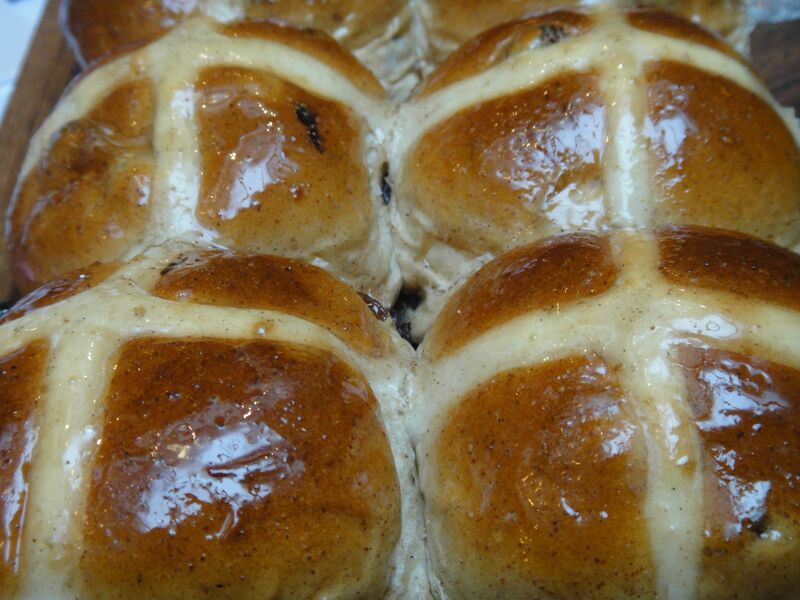 A couple of weeks ago we gathered at Fifteen, lured by the promise of what turned out to be, frankly, the finest Hot Cross Buns known to man. There they are in all their sticky glossy gloriousness. We had the privilege of sitting with the lovely Kenny, master baker at Fifteen who’d also made delicious candy-coloured rhubarb and ginger jam which we piled on high, before I proceeded to pillage the vast brunch menu, and order…. Yeah. 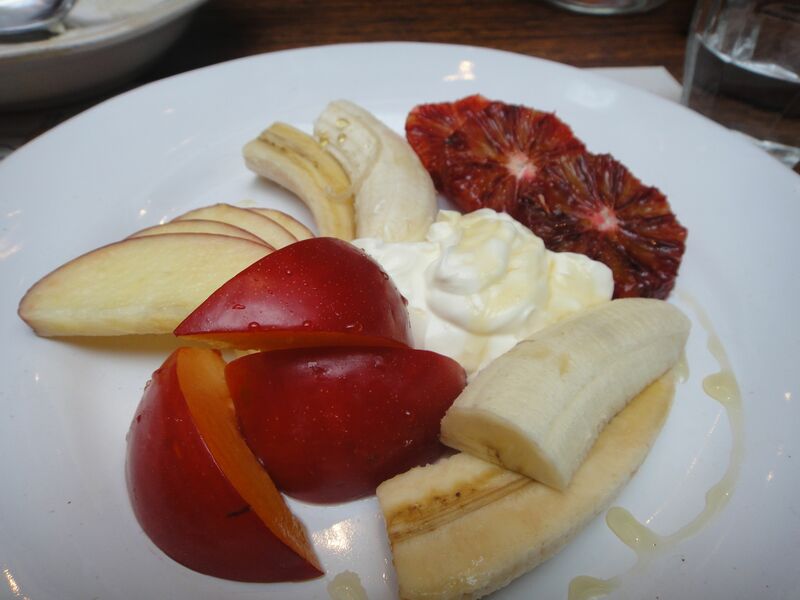 The fruit plate and the porridge. I was obviously having some sort of healthy epiphany (short-lived, natch) but it was actually very good and here’s where I think Fifteen scores very highly – it does a proper brunch. By that I mean there are decent Bloody Marys – ok, not unlimited but let’s not run before we can walk here – and a wide range of food options from sweet to savoury with the traditional hangover cures in the middle. I did slightly wish I’d followed Louis‘ example and had the eggy brioche though because actually, I think anything coming out of Kenny’s kitchen is going to be superbly good and just having his sourdough bread toasted and spread with jam and salty butter all morning would have been an absolute treat. 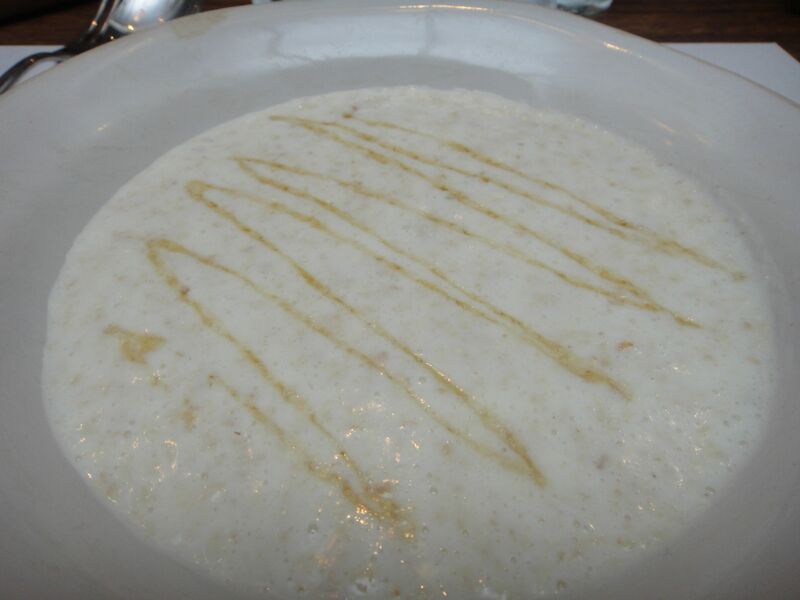 We lingered through to almost lunchtime – we’ll go again and it would be great if the breakfast was served longer at the weekend. For weekdays, they have free wifi too…. I lived around the corner from Fifteen when it first opened and Jamie Oliver started spreading his mission about getting ‘hard to reach’ young people into professional kitchens and training them to be fully qualified. It’s hard to believe that that was ten years ago. Now the empire spans Cornwall and Amsterdam too. 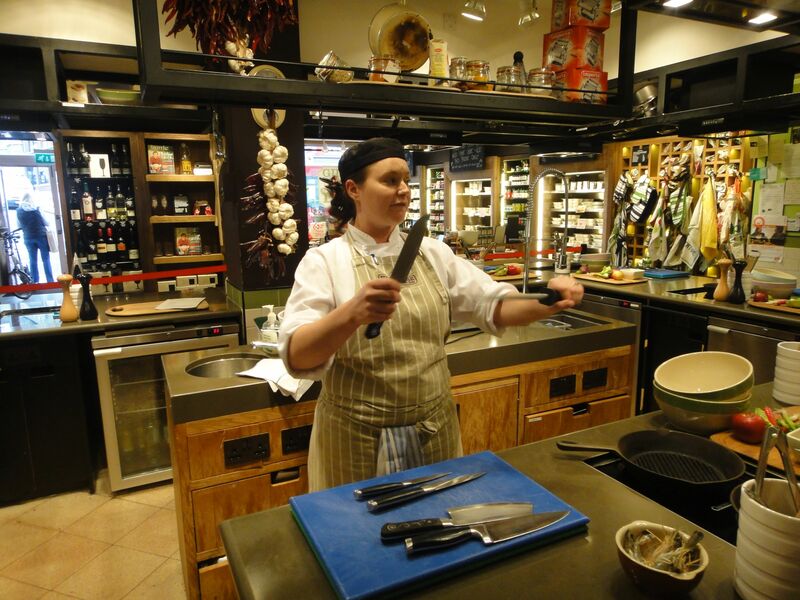 Jamie’s passion for cooking, and equally food education is legendary. Recipease is another part of his mission. Uyen and I went down to take a knife skills class (apparently the most popular class they run at the Clapham Junction location). The rather brilliant Annegrete, a professional chef who used to work at Fifteen, put us through our paces for the two hour class. This was after having a good mosey around the very well curated selection of homewares and merchandise in the shop – you really could drop serious cash here. The classes are reasonably priced – £30 for ours including cooking our own lunch, and a glass of wine thrown in, plus you get 10% off in the shop afterwards. Some on Twitter asked how basic the class was. Well, the skills are basic but I think a lot of us who consider ourselves competent in the kitchen are probably not as fast or indeed as efficient as we could be in terms of knife skills. We all thought we’d progressed pretty far during the class and then Annegrete proudly told we’d done well, and with six months’ practice, we’d be great. Gulp. The Trattoria at Fifteen London is open for breakfast and brunch 7:30am to 11:00am Monday to Saturday, and 8:00am to 11:00am Sunday. Thank you to the fabulous Hannah Norris at Nourish and the crew at Recipease for inviting me. 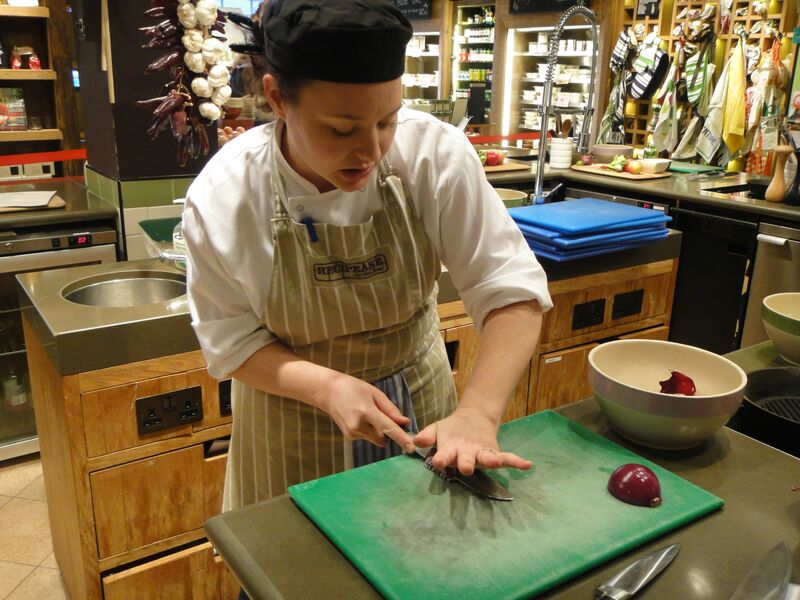 Went for knife skills at Recipease in Jan and thought similar: Basic skills course is just that, but if you know your rock from your cross chop you’ll still have a good time and you get a discount in the shop afterward! I’m sure we can find someone to do the music. It’s going to be a HIT! Woo-wee, that sounds like fun. I am now personally dying to know what rock, tap and cross chopping is… Whatever it is, it sounds big, clever and fun. The class sounds great. It’s worth having a peek at the homewares and grabbing a coffee or a glass of wine there… whoever their buyer is, they’re good. I had no idea he had one of these schools/shops in Clapham Junction! Very good to know! The knife skills course sounds great. Quite reasonably priced too. Thanks for the heads-up.